A Wisconsin combat veteran was driving down the highway in February when he suddenly found his name, license plate number and mental health information broadcast on the radio, on television and posted on electronic billboards across the state as part of a "Green Alert." A new Wisconsin law allows authorities to put that information out the same way an AMBER Alert publicizes missing children. A Wisconsin combat veteran was driving down the highway in February when he suddenly found his name, license plate number and mental health information broadcast on the radio, on television and posted on electronic billboards across the state. "It felt very violating. Because I didn't want everyone who doesn't know me to know I have problems. It made me want to crawl into a bigger hole," he told NPR. But the "Green Alert" might have saved his life. 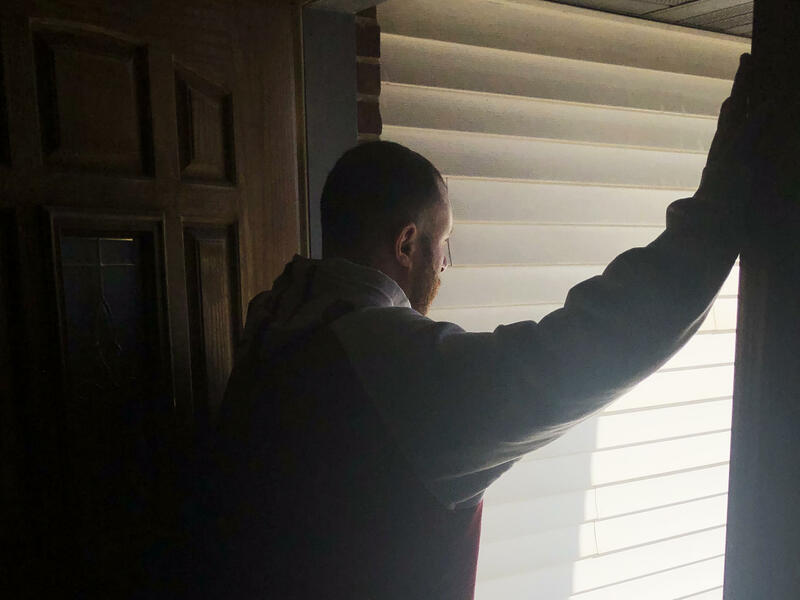 "It's still affecting me dramatically and negatively, but at the same time it's quite possible that it's why I'm here right now," says the former Air Force staff sergeant. "It's kind of a double-edged sword." NPR is not divulging the man's name because he never consented to have his information made public. A new Wisconsin law allows authorities to put that information out the same way an AMBER Alert publicizes missing children or a Silver Alert does for people with cognitive impairment. It's the first Green Alert to take effect — green for the color of military fatigues — though many states are considering the program. The Wisconsin law is called the Corey Adams Searchlight Act. Adams was an Afghanistan vet from Milwaukee who went missing in 2017. His family feared he was suicidal. But police didn't immediately treat him as a missing person, because unlike children, adults have a right to disappear if they want to. Adams was found dead weeks later. His family mobilized around the idea of an alert system for veterans and it became law in Wisconsin last year. That attracted a powerful advocate – the retired commander of U.S. special forces in Africa, Brig. Gen. Don Bolduc. "We do it for our elderly because we have a tremendous amount of respect for our elderly. We do it for our children because we love our children. And we need to do it for our veterans, too," says Bolduc, who served more than 30 years on active duty. Special Operations Command Africa Commander Brig. 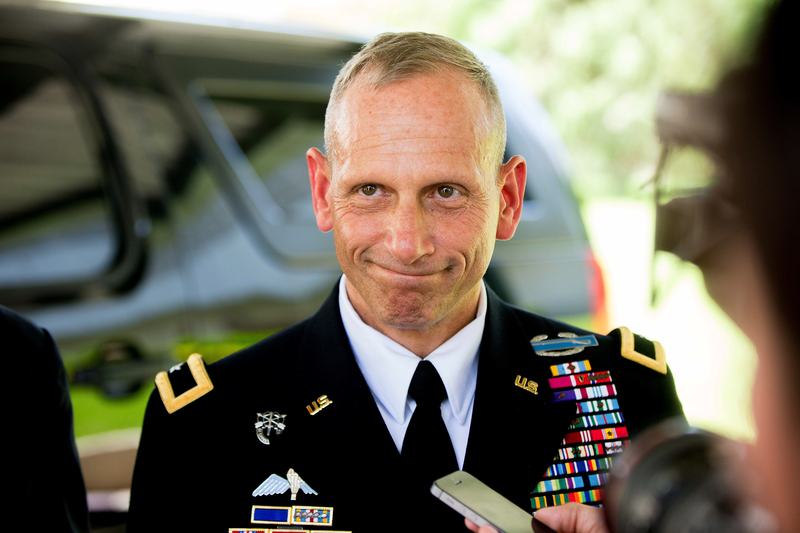 Gen. Donald Bolduc pauses while speaking to members of the media outside the U.S. Embassy in Chad in N'Djamena, Chad in 2016. Since his retirement, Bolduc has become a powerful advocate for Green Alerts. Since his retirement in 2017, Bolduc has focused on the high suicide rate among veterans - which VA estimated is about 20 per day. He says the first 24 hours when someone goes missing are crucial to preventing suicide. Bolduc got in contact with his New Hampshire senator, Democrat Maggie Hassan. Hassan has now co-sponsored a bill to promote Green Alerts nationally, with Republican Sen. Joni Ernst of Iowa, herself an Iraq vet. Their bill would create a commission to suggest best practices for states setting up Green Alerts, incorporating concerns about veterans' privacy. One state considering a Green Alert system is Connecticut, where Steve Kennedy is a veterans' advocate – and not a supporter of the program. "I have struggled with these things. I have been suicidal myself. I've struggled with PTSD and depression," says Kennedy. "The last thing I would have wanted when I feel like everything is falling apart and I'm just completely hopeless is to have all of that sent out to every person I have ever known." Kennedy says he's afraid lumping veterans in with lost children and those with cognitive impairment is stigmatizing. Plus, once a veteran has been Green Alerted, the news reports — potentially including information about the veteran's mental health — remain an enduring part of his online profile. Only a few Green Alerts have actually been triggered - all in Wisconsin. One of them is the Air Force staff sergeant who spoke with NPR. The former staff sergeant served in both Iraq and Afghanistan. He's quick to say he never saw heavy combat, though his C-130 transport plane did get shot at. Still, PTSD hit about a year after he got home in 2005. That's not unusual - the roots of post-traumatic stress aren't always clear. The majority of military suicides are people who didn't deploy or see combat. He's been receiving care at the Madison, Wisc. VA, for over a decade and he likes it. But his problems haven't gone away, and in February, he says, he was suicidal, and on the phone with the VA's Veterans Crisis Line. "They made clear they were going to do everything they could to find me," he says. And that was the point where they initiated that Green Alert and had my face and vehicle info and everything everywhere. He headed out of state, toward a fellow-veteran's house. When he got there his friend quietly called the police. And luckily, the former staff sergeant says, there was another veteran among the group of cops who showed up. That vet kept things calm and talked him into going to the hospital. "It probably helped find me. But I don't know that it helped me, if that makes sense," he says, " 'cause I still face on a daily basis a constant barrage of questions about my personal life. "Someone walks up to me in the middle of a meal in a restaurant, and says, 'Hey are you that Green Alert guy?' And immediately I'm taken back to those emotions," he says. "I certainly respect the gentleman's concerns," says retired Brig. Gen. Don Bolduc. But Bolduc believes the Green Alert system can be done right, to balance privacy with saving lives. "Any program we can get to help them is worth pursuing, you know," says Bolduc. "I want my loved one alive, right?" When a child goes missing, authorities can send out an Amber Alert. It reaches people in the area through their phones, their radios, TV screens and on highway billboards. Authorities can also send out what's called a Silver Alert to help find older people who are cognitively impaired. Both programs are meant to find people who cannot help themselves. Those are a bit different from the Green Alert. It's a new warning system for veterans who are believed to be at risk. So far, Wisconsin is the only state with a Green Alert program, but a bill to promote it nationally is moving through the U.S. Senate. NPR's Quil Lawrence reports with a high rate of suicide among veterans, the effort to save lives can conflict with a desire to protect privacy. QUIL LAWRENCE, BYLINE: If you live in Wisconsin, you may already know what a Green Alert sounds like on TV. UNIDENTIFIED REPORTER: Authorities are looking for a missing Eau Claire veteran. Thirty-six-year-old (beep) was reported missing by family and is considered a veteran at risk. LAWRENCE: It's statewide with name and license plate number, picture, height and weight. UNIDENTIFIED REPORTER: (Beep) suffers from PTSD from his service overseas as well as depression. He may be traveling to North Dakota and may have a handgun in his possession. LAWRENCE: That's how it sounds. This is how it feels if you're the veteran. UNIDENTIFIED VETERAN: They initiated that Green Alert and had my face and vehicle information and everything everywhere - everywhere, on the Internet, radio. It was on the highway signs, the electronic signs. There was - I was on TV, on the news. LAWRENCE: This Wisconsin combat vet, a former Air Force staff sergeant, was in a Green Alert like the one you just heard. He found himself driving down the highway when his name and his mental health condition appeared on the billboards. LAWRENCE: We're withholding the sergeant's name to protect his privacy though it's a bit late for that in Wisconsin. He never consented to having his name and his health conditions made public. UNIDENTIFIED VETERAN: You know, when it felt very violating 'cause I didn't want everyone who doesn't know me to know I have problems - made me want to kind of crawl into a bigger hole. LAWRENCE: That is not to say the sergeant is completely opposed to Green Alerts. But first some background - the Wisconsin law is called the Corey Adams Searchlight Act. Adams was an Afghanistan vet from Milwaukee who went missing in 2017. His family feared he was suicidal, but police didn't immediately treat him as a missing person. Adults have a right to disappear if they want to. Adams was found dead weeks later. His family mobilized around the idea of a Green Alert system, and it became law in Wisconsin last year. And that attracted a powerful advocate. DON BOLDUC: My name's Don Bolduc. I am a retired soldier. LAWRENCE: He's actually a retired general who commanded special forces - numerous combat medals. BOLDUC: I'm not going to say it, though (laughter). LAWRENCE: He doesn't brag. What Bolduc has been public about is his PTSD and a traumatic brain injury from more than 10 combat deployments. BOLDUC: I put skin in the game. I've come out public on active duty. We have to continue to destigmatize these things so that our veterans aren't afraid to get help. LAWRENCE: Bolduc has focused on the high suicide rate among veterans which VA estimates is about 20 per day. When he heard about the Green Alert, he was all in. He says the first 24 hours when someone goes missing are crucial to preventing suicide. BOLDUC: We do it for our elderly because we have tremendous amount of respect for our elderly. We do it for our children because we love our children. And we need to do it for our veterans, too. LAWRENCE: Bolduc got in contact with his New Hampshire senator Democrat Maggie Hassan. Hassan co-sponsored a bill to promote Green Alerts nationally with Republican Senator Joni Ernst of Iowa, herself an Iraq vet. Here's Hassan and Ernst on Fox News. MAGGIE HASSAN: What this bill would do would be establish a commission at the federal level to help states develop best practices to develop their own Green Alert systems. JONI ERNST: As a combat veteran, I have seen this many times over. The Iowa State Senate just passed a Green Alert bill unanimously in my home state. LAWRENCE: Many other states are considering Green Alert bills, including Connecticut, where Steve Kennedy is a veteran's advocate. He's an Iraq vet. And when he first heard about Green Alerts, all he could think about was the unintended consequences. STEVE KENNEDY: I have struggled with these same things. I mean, I've been suicidal myself. I've struggled with PTSD and depression. And the last thing that I would have wanted while I'm feeling like everything is falling apart and I'm just completely hopeless is to have all of that sent out to every person I have ever known. LAWRENCE: Kennedy says he's afraid lumping veterans in with lost children and impaired elderly people is stigmatizing. Only a small number of Green Alerts have actually been triggered, all in Wisconsin. One of them is the Air Force sergeant who spoke with us. UNIDENTIFIED VETERAN: And I found out about the Green Alert, and I at that point changed direction and headed out of state. LAWRENCE: The sergeant deployed to Iraq and Afghanistan. He's quick to say he never saw any heavy combat, but his plane did get shot at. UNIDENTIFIED VETERAN: We'd get some bullets, you know, here and there. So when we would land, I'd have to go and get sheet metal crew out there to fix those panels that would get hit by bullets. LAWRENCE: Still, PTSD hit about a year after he got home in 2005. That's not unusual. The roots of post-traumatic stress aren't always clear, and the majority of military suicides are people who didn't deploy or see combat. He's been getting care at the Madison VA for over a decade, and he likes it. Still, in February this year, he found himself on the phone with the suicide crisis line. UNIDENTIFIED VETERAN: It was just kind of made clear, you know, that they were going to do everything they could to find me. And that was the point where they initiated that Green Alert. And I had my face and vehicle information and everything everywhere. LAWRENCE: He was a mess when he got to a friend's house. His friend quietly called the police. And luckily the sergeant says there was another veteran among the dozen or more cops who showed up, and that vet kept things calm and talked him into going to the hospital. He's of two minds about the Green Alert. UNIDENTIFIED VETERAN: It probably helped find me, but I don't know if it helped me (laughter), if that makes sense. LAWRENCE: He thinks it maybe saved his life. But since then has been rough. UNIDENTIFIED VETERAN: 'Cause I still face on a daily basis a constant barrage of questions of my personal life and what had happened that day when I don't want to discuss that with those people. It's not their business. Someone will walk up to me in the middle of a meal at a restaurant, you know - hey, are you that Green Alert guy, you know? And it's just - and then immediately I'm taken back to all those emotions. BOLDUC: I certainly respect the gentleman's concerns. LAWRENCE: That's Don Bolduc, the special forces General. BOLDUC: You know, they're valid concerns, but you're not weak. You're strong. LAWRENCE: Strong, Bolduc says, for reaching out to get help. He says the Green Alert system can be done right to balance privacy with saving lives. BOLDUC: Any program that we can get to help them is, I think, worth pursuing. You know, I want my loved one alive, right? LAWRENCE: The Wisconsin sergeant gets his point, but he's still of two minds. UNIDENTIFIED VETERAN: It's still affecting me dramatically and negatively, you know? So, you know, but at the same time, it's very possible that that's why I'm here. So it kind of goes both ways. LAWRENCE: The bill in the U.S. Senate is to set up a commission on how to do Green Alerts. And he's hoping they get it right. Quil Lawrence, NPR News, near Madison, Wis. Transcript provided by NPR, Copyright NPR.